Had a fantastic night’s sleep at The Chalet Queenstown, an accommodation I chose for it’s central location and highly personalised service. just in case you’re asking. Before breakfast at 7am, I went for a stroll to experience central Queenstown during it’s “quiet time”. What a difference from the nightlife a few hours ago! I loved the relaxed atmosphere and walking along the lake it seemed that even the huge rainbow trout of Lake Wakatipu had slowed down. Now we are start driving from Queenstown to Fox glacier, which will take about 5.5 hours. 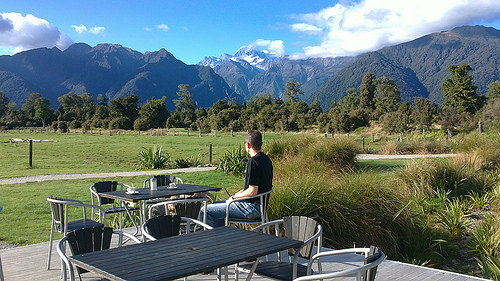 View some sample itineraries which include Queenstown and Fox Glacier. After a generous breakfast at The Chalet – it was back on the road to Wanaka ( only an hour’s drive via Cromwell or 40 min through Cardrona). Still foggy, but slowly clearing up to yet another stunning Central Otago winters day! Wanaka is the ‘smaller sister’ of Queenstown – just as pretty – but with a calmer personality. 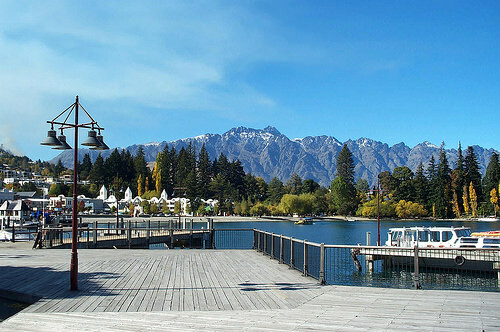 Like Queenstown, Wanaka is located on a huge lake, very near to ski fields and brimming with great accommodation and tour options. After checking out an apartment complex for some of my guests, I popped over to my favourite Wanaka café, Ritual Espresso Cafe. It doesn’t have waterfront views, but it does have great coffee, tasty food and prompt service. Pam loves their gluten-free options. Must try Francesca’s Kitchen the next time! I am now on my way to the West Coast of the South Island, (via Haast Pass) to visit Fox Glacier Village and Franz Josef village, where I’ll be staying tonight. It should take me approximately 4 hours. The weather has now totally cleared up and what a pleasure it is to travel those empty New Zealand scenic road in the off-season (May-September). The views along Lake Hawea, over “The Neck” to the northern parts of Lake Wanaka are just out of this world folks! At Diana Falls there’s still some work on a major road slip from last year, but after that, my next stop is at “Ship Creek Walk”,about 10kms north of the tiny village of Haast. A stop at Ship Creek is highly recommended to stretch legs and check out the first beach when coming from the south (or the last going there). Interestingly, the majority of travellers on the West Coast of the South Island would travel from North to South. However, I felt there was much less traffic travelling from south to north. So if you’re planning a trip to the West Coast, that’s maybe something worth remembering. Important update regarding Fox and Franz Josef Glaciers!! It’s been 2 years since my last visit to Fox Glacier and it was a sobering sight to see those giant ice rivers retreating so much into their valleys. The rain and snowfall over the past 5 years has been well below average. 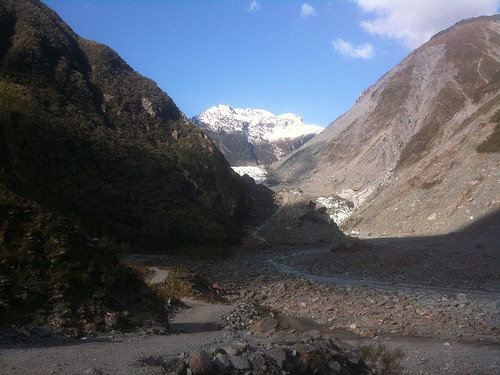 Although the local Glacier guiding companies still offer glacier valley walks, the longer ice walks from the lower part of the glacier, are no longer available. However, ice walking tours are available with a short helicopter ride. I walked a short way to both Fox and Franz Josef glaciers and was impressed with the good work DoC (Department of Conservation) has done with viewpoint and barriers. Here’s the positive news: to get the best out of your Glacier experience, I totally recommend joining a “Helihiking” guided walks (2 x short helicopter flights and about 2 hours guided walk) into the middle area of the glaciers (nailed boots, socks, crampons and walking stick are provided) OR a scenic helicopter flight landing in the upper part of the glaciers – called Neve. … Gillespie Beach, Okarito Lagoon and numerous walks such as Alex Knob – nature experiences you’ll never forget. Having now completed my main task for this quick “famil” I am hitting the road yet again, heading back via Reefton to Nelson. From Invercargill to Nelson I travelled a total of 1250 kms in 3 days – madness! Please don’t do this! Take your time to enjoy one of the most stunning scenic roads on planet earth and get ready for plenty of photo stops! View some sample itineraries which include Queenstown and Fox Glacier.